The friendly villagers are used to tourists and are open to interaction. Homes are generally very sparse by Western standards. Expect few windows because of the extreme cold in winter. The valley also has fog which in turn gets into blankets and pillows, another reason why houses are designed to be sealed up tight. 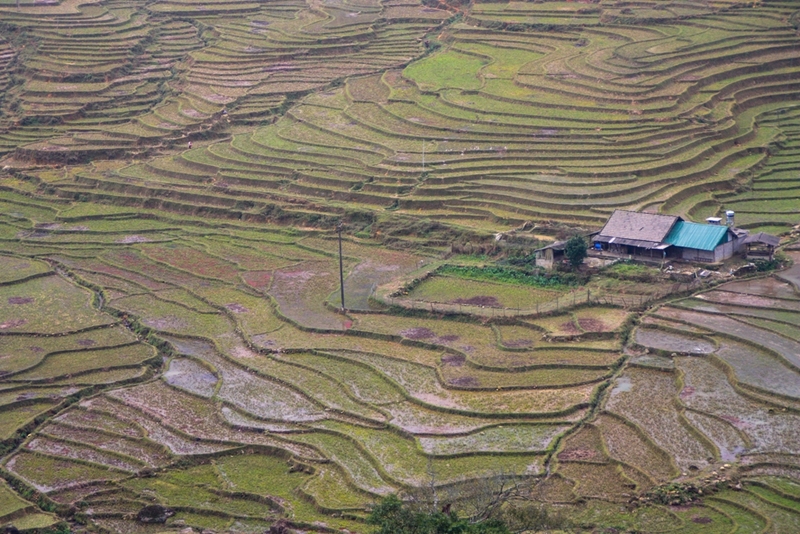 Between the main villages, there are wide cemented paths for ease of travel, either by walking or motorbike. There are countless paths off the main path, though. Some are narrow but paved, like the one below. And some are little more than muddy trails. In the morning mist (and during the rainy season), the paths can get very slippery! 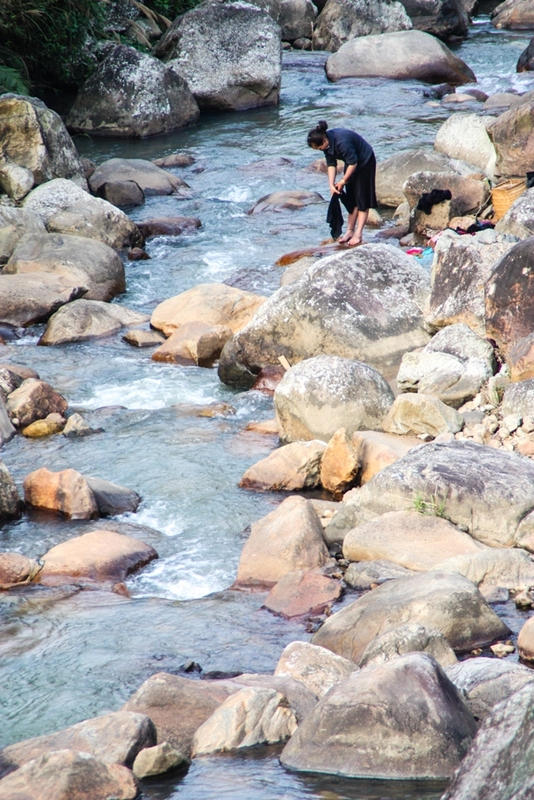 … and passing by scenes that could be from a hundred years ago with villagers harnessing the power of the river for laundry, milling rice and many other things. 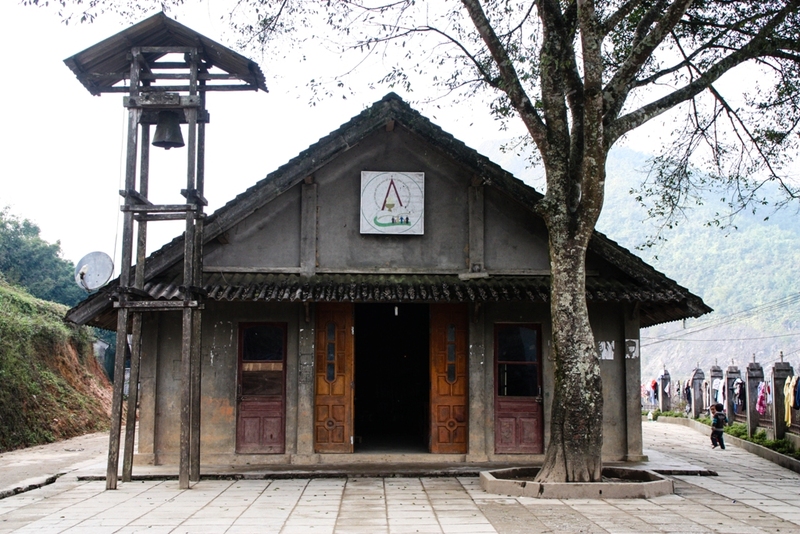 On a walk through the villages, you’ll likely come across small schools as well. 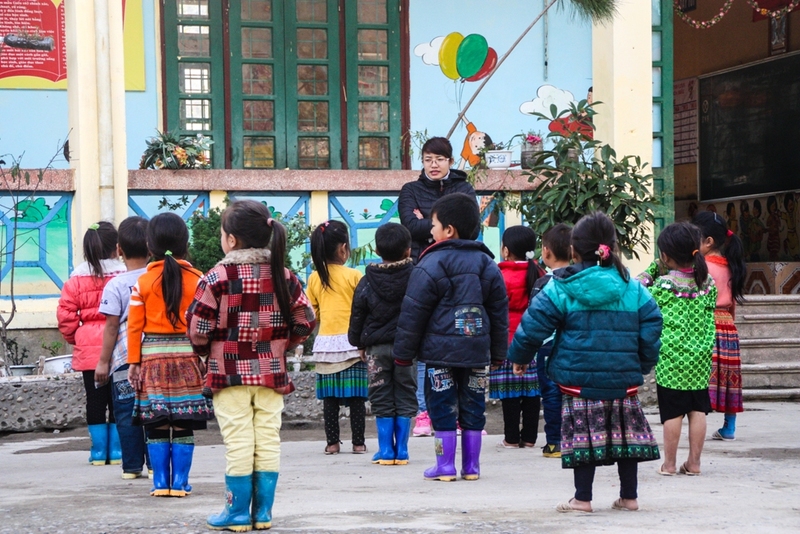 Here, it’s time for morning exercises, with students all bundled up against a cool day. 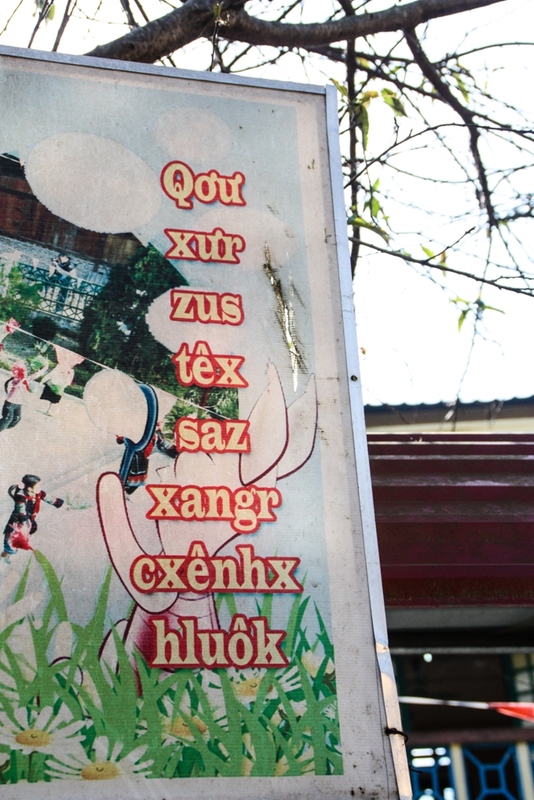 Children in the area learn Vietnamese at school, but often speak their own dialects at home. 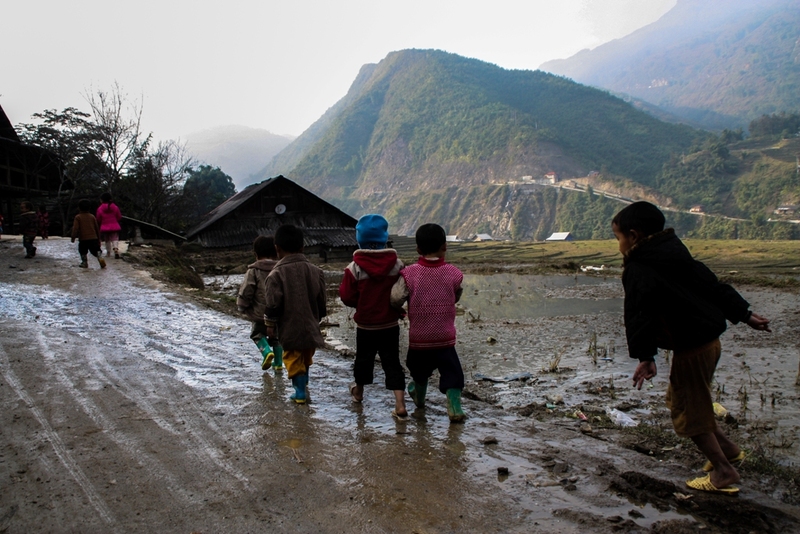 In the mornings and afternoons, expect to share the trails with groups of children coming and going to school. 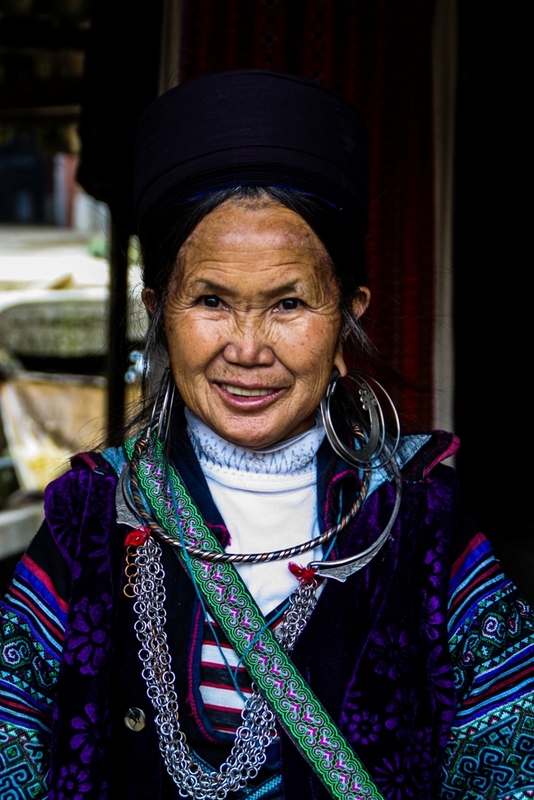 While it’s easy to think that the local women only put on traditional dress for tourists, in reality, these colorful garments are their everyday garb. 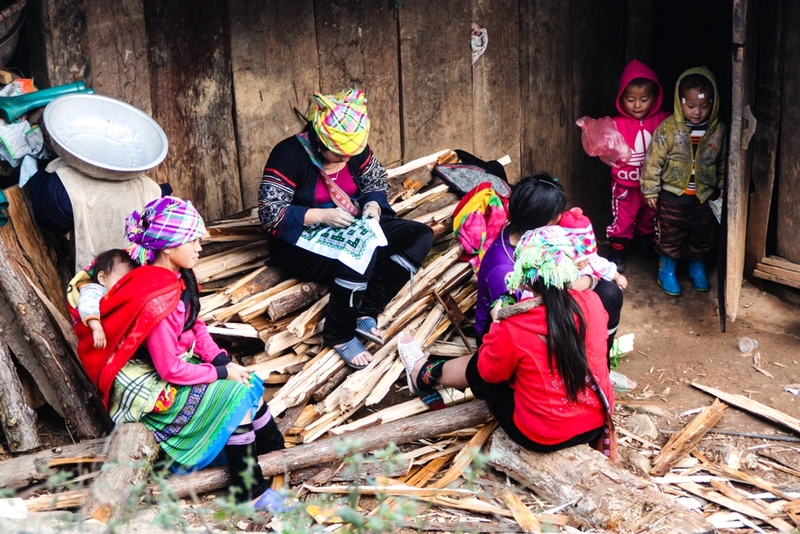 All around the villagers, women can be seen dyeing, sewing and embroidering traditional clothes which they wear when going to market, or just for a visit at a neighbor’s home. While there are many elementary schools, there are fewer high schools which means that some students must come from far away to continue their education. 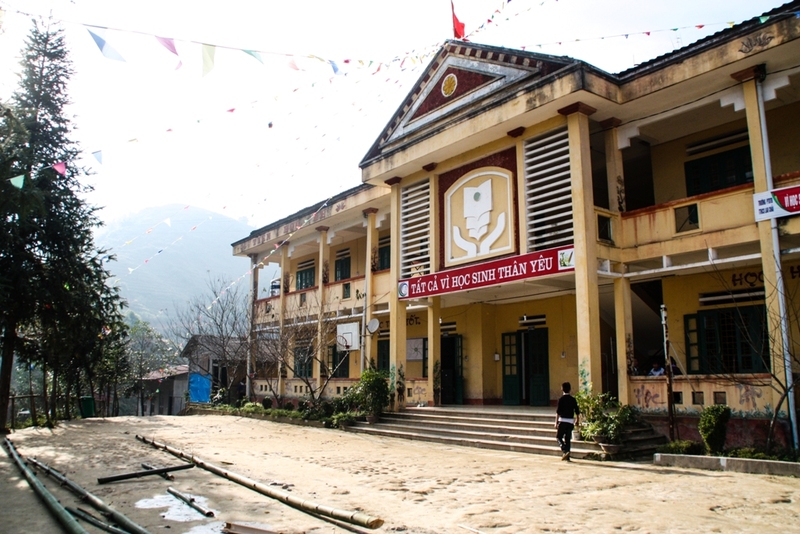 This school is located on a mountainside in the Muong Hoa Valley and includes a dormitory where students sleep. 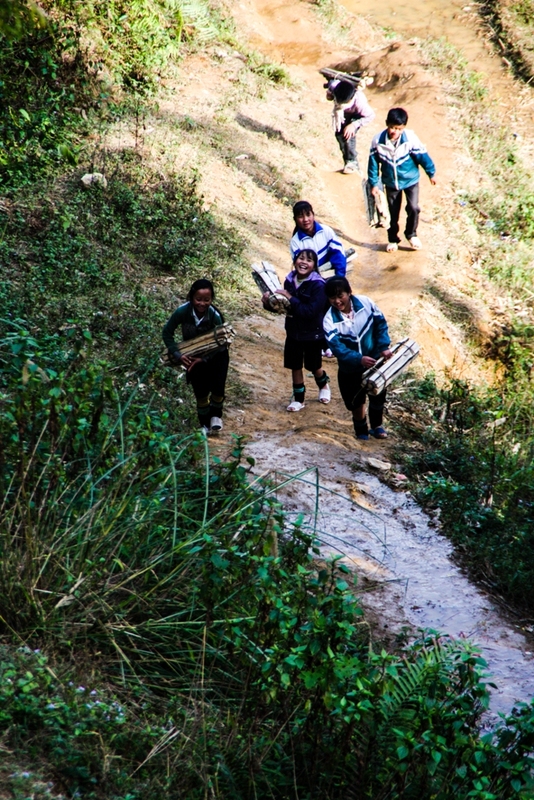 Here, everyone pitches in to do chores including bringing firewood up to the school. 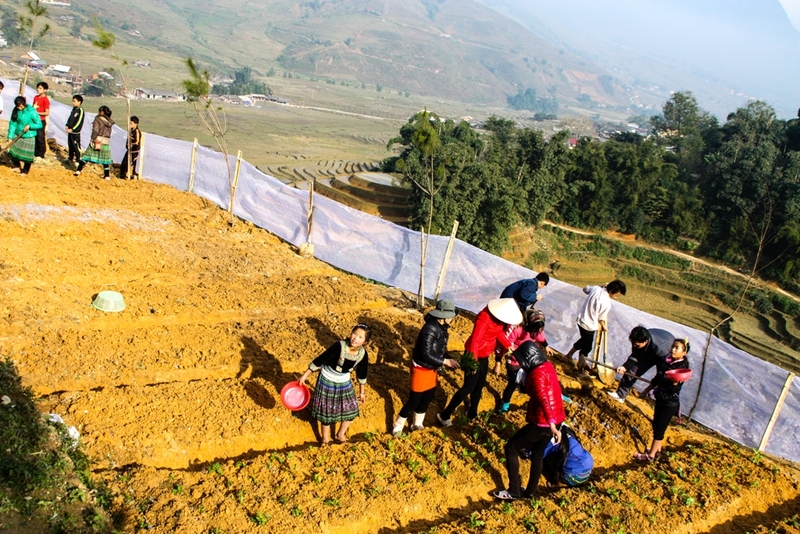 Students form a human assembly line to gather water from the stream up to a plot of vegetables. Children learn from an early age that hard work is needed to survive and that it’s everyone’s responsibility to help out. 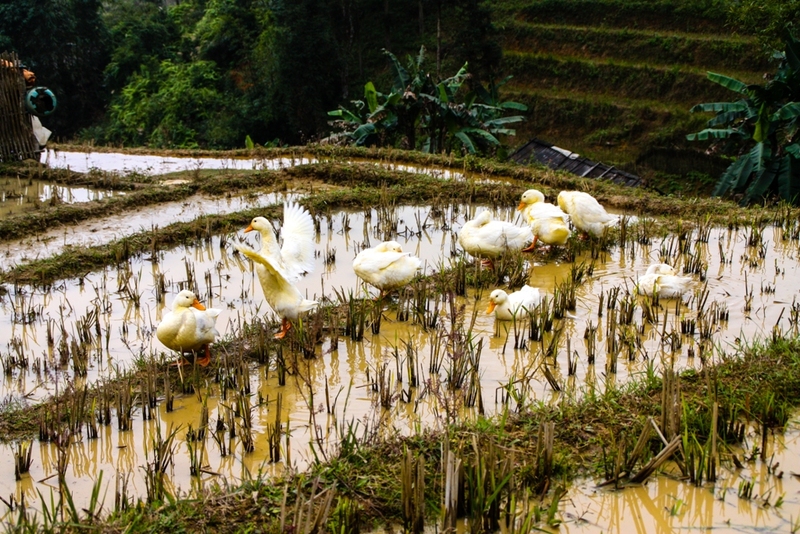 The rice planting season begins in May and reaches its peak in September / October when it’s harvested. 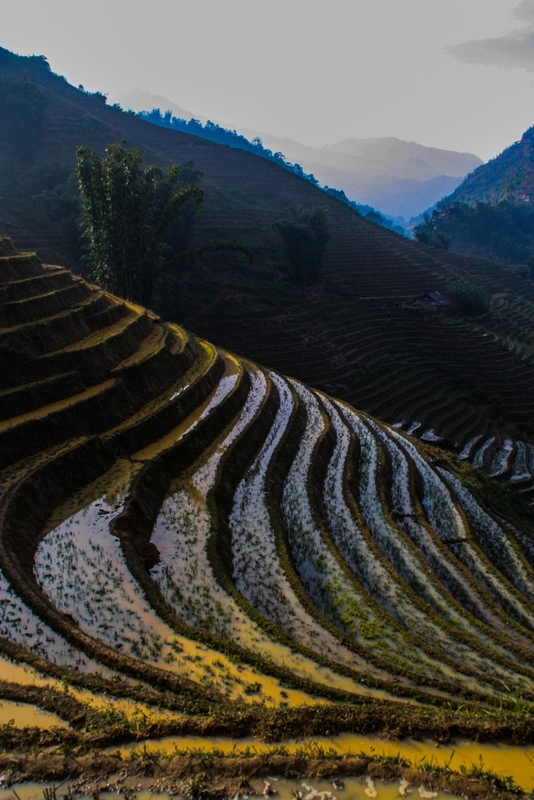 While these months produce the best photos (when the fields are full and yellow-green at harvest time), the terraces are beautiful any time of year. We took the photos in this post in late-December. The local minorities are mainly animists (belief in the spirit world and in the interconnectedness of all living things) and you’ll notice little things in the home that speak to their beliefs (for instance, strung across the door frame), but some in the area are also Christian, as this little wooden church shows. Dress modestly even when it’s hot outside. 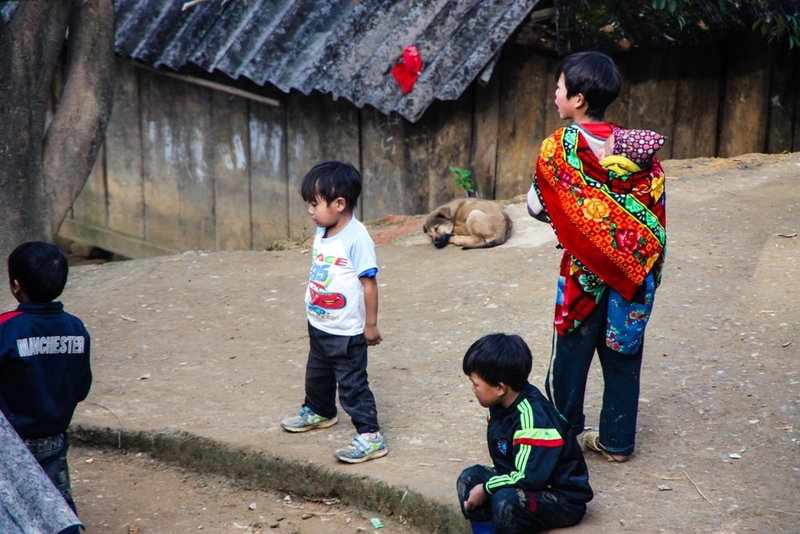 The living standard amongst the hill tribes is generally low. 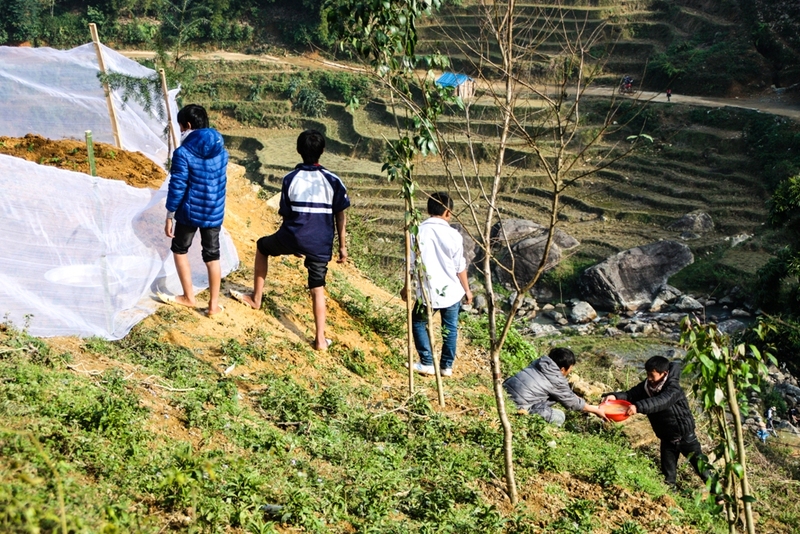 The best way to help is to employ local guides and support local homestays. 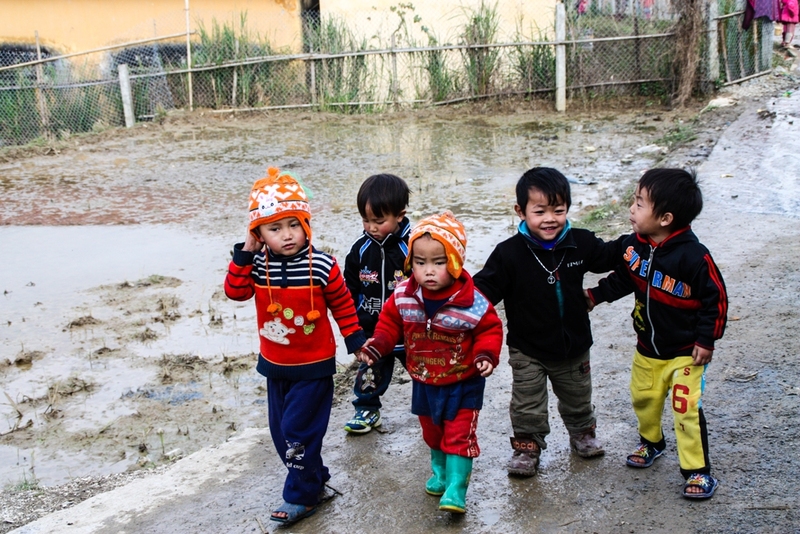 Instead of giving gifts or buying from children, ask your guide if you can donate supplies to a school instead. Be respectful of religious rituals and iconography. Wearing sturdy shoes is recommended. 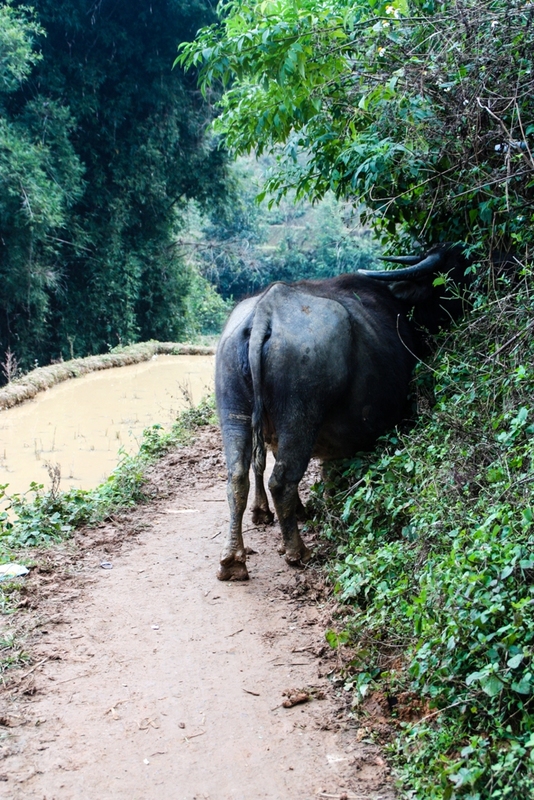 Some may also find walking sticks helpful (widely available in shops in Sapa town) as the paths can be very slippery / muddy. 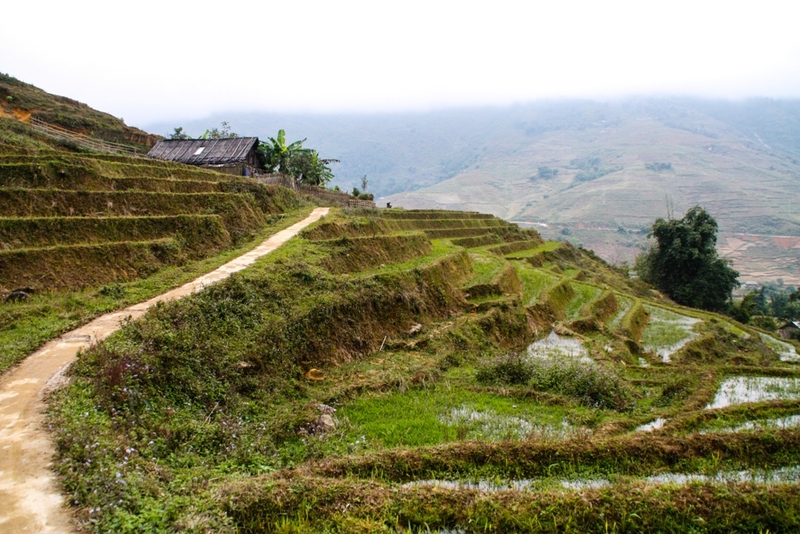 A guided trek in the Muong Hoa Valley can be paired with a night or two at the Victoria Homestay, exclusively for guests of Victoria Sapa Resort & Spa and its partners. 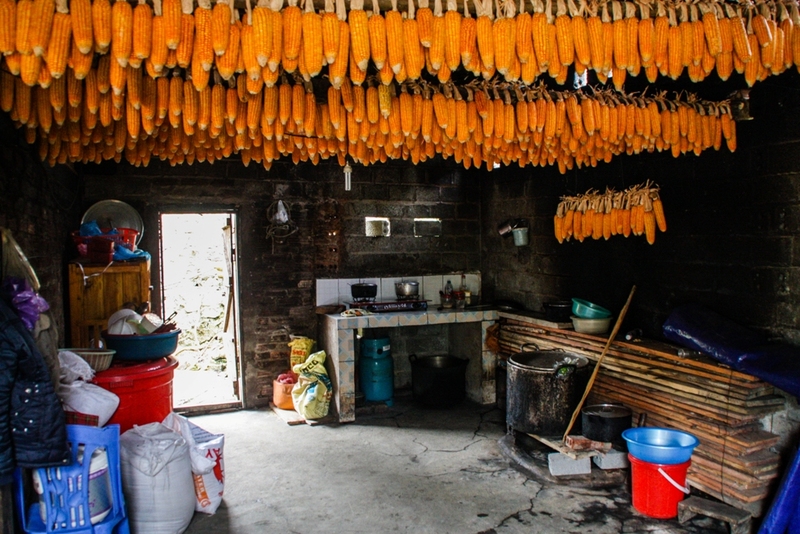 Your magical homestay experience right in the valley can also include an herbal footbath, batik class and helping your host prepare a rustic meal over an open fire. 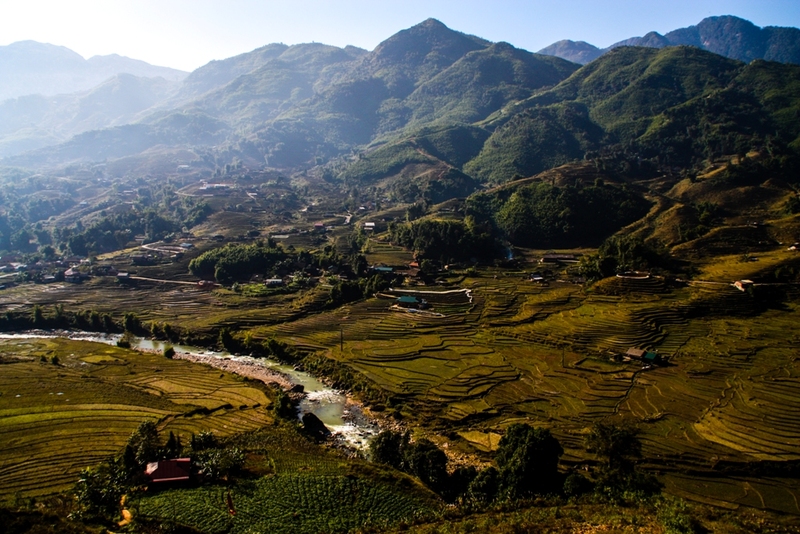 Email resa.sapa@victoriahotels.asia or visit the website. 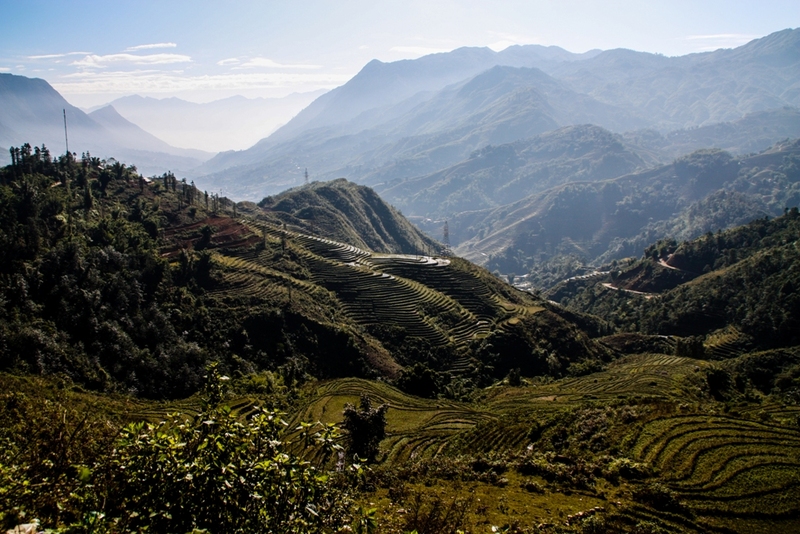 For more of our posts about Sapa, click here. 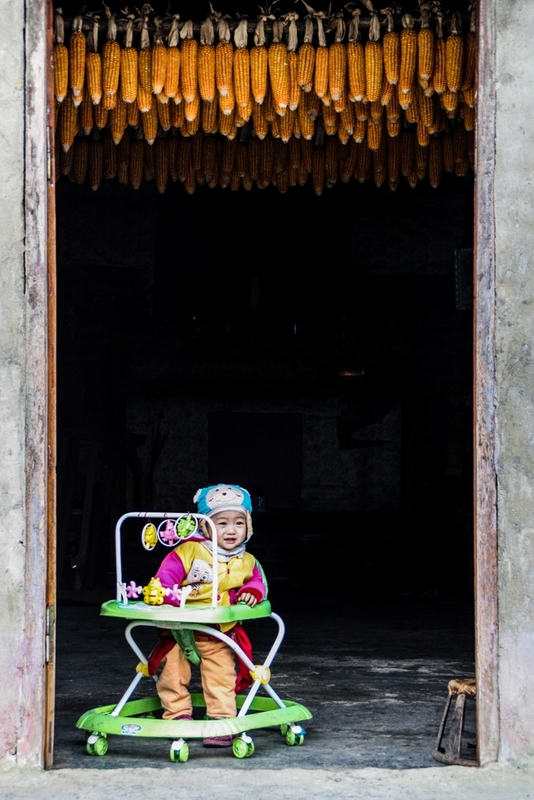 The Ancient House of Binh Thuy	Summer. Sea. Sand. Victoria.